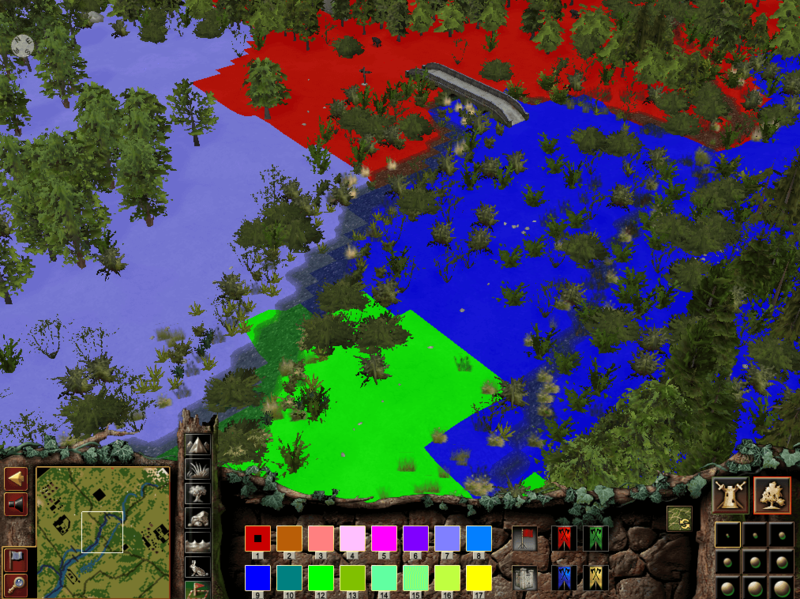 Painting estates is probably one of the most critical, but most overlooked, elements of Stronghold 2 map editing. Stronghold 2 adds this whole new feature which simply wasn't present before in any previous game, and for this reason it's important to understand exactly what this aspect of the game does. If you load up a custom Stronghold 2 map and immediately lose with an instant defeat, this is almost certainly the reason why. It's generally best to start with larger brush sizes while you're painting estates. To paint your estate, you should select one of the colours from the palette. There are 16 different colours, and therefore, a maximum of 16 different estates per map. For some reason, number 11 does not appear to be on that list. It's also important to note that because you can only have 16 different estates, if you paint two separate areas the same colour they will both belong to the same estate. You can choose whatever colours you would like for the estates. Though if does help if you use a system. 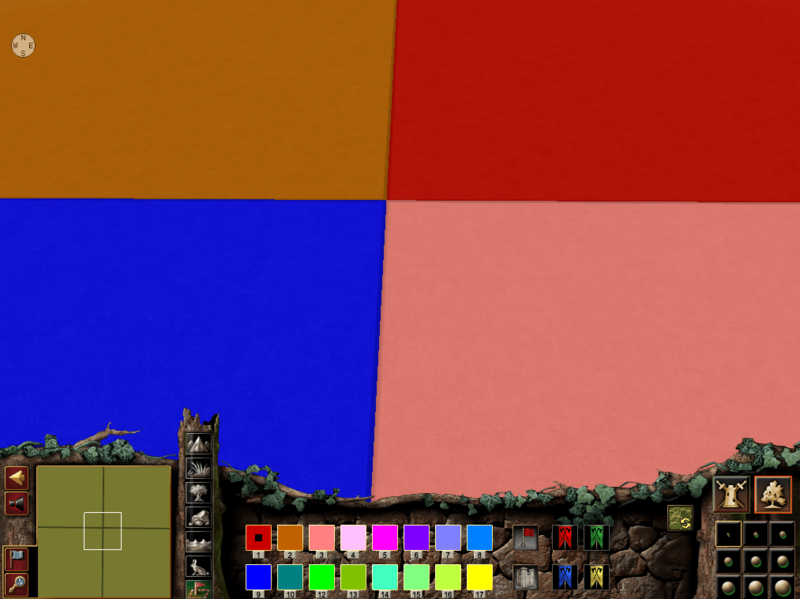 Some people choose colours similar to represent those AI Lords they would like to own the estate. Personally, I tend to just work my way along the list numerically. Once you've selected which colours you would like to use on your estates, you should paint them as you desire. The best maps have estates which follow the pattern of the landscape rather than straight lines, but for the purposes of this tutorial, that's exactly what I'm going to do. 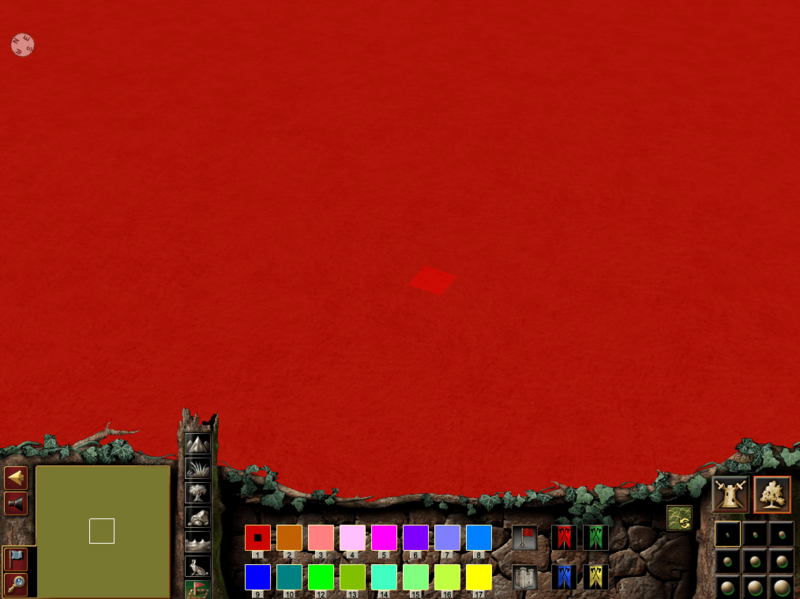 Once done, you can switch to any other palette in the editor and this will return the view to normal. But you can highlight estates on the minimap in the same way you would in-game. The next thing which you must do is decide whether this should be a Castle estate or a Village estate. There's a very important difference here: a Castle estate is an estate where a player or AI lord can have a castle there. If there isn't a player or AI lord in that estate in the game, it turns to a village estate instead. A Village estate do not have a castle, and are villages of workers who you can get to produce resources. These can then be transported to Castle estates. To place a Castle estate, you want to place a Castle Marker in your chosen castle estates. The red marker is a village estate. If you place neither flags, the estate belong to nobody in the game. This can be useful in certain circumstances, but unless you are doing this for a reason you should always place marker flags. Kingmaker scenarios, as well as custom war and peace custom scenarios require at least two castle estates: one for the player and another for an emeny Lord. Even if you only want a single estate on your map, you must still place a castle marker. Select the flag you want, and left click anywhere in the estate where you want that to be placed in the game. Be careful here because they do both place the same marker flag in the estate, but they do completely different things. The castle flag represents where the player's keep will be placed in the game, while the village flag represents where the village hall will be placed in that estate. They are all unassigned by default, so you must tell the game who owns which estate. There are a total of 10 Shield icons to the right of the minimap. The red one represents the player. The other ones all represent various AI characters that exist in the game. Click on a flag, and then click on a castle estate to award that castle estate to the player. 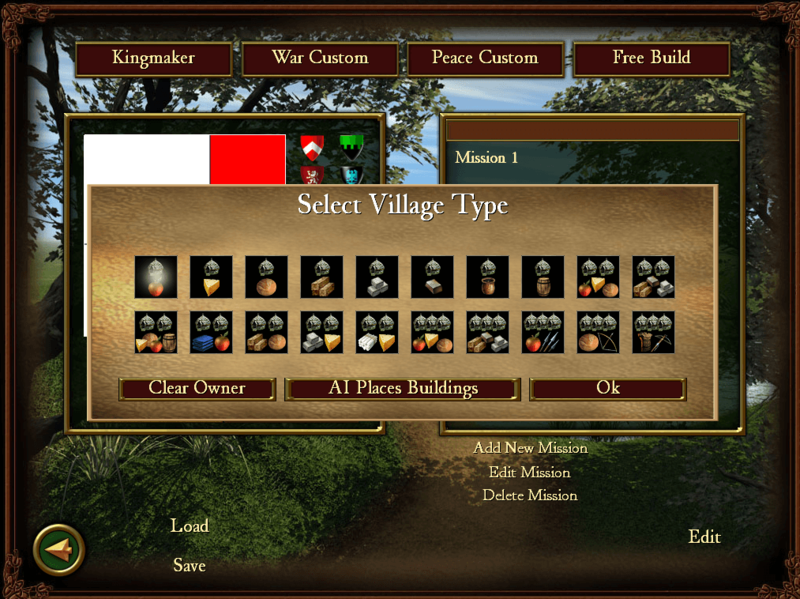 You can also do the same with village estates, so that players by default own specific estates at the start of the game. If you award an estate in error, you can replace it by simply selecting a new Shield and replacing that owner. To stop adding to a particular player, right click anywhere on the editor screen. You can also clear the owner entirely by left clicking on an estate and selecting the "Clear owner" button. In this screen you can also select whether the AI should place buildings in that estate or whether the player should place them using the map editor. Note that when selecting this on castle estates, it will only happen when there is no Lord present in that estate. This could be because e.g. the Lord in that estate dies, or it could also be due to the fact no Lord ever existed in that estate. 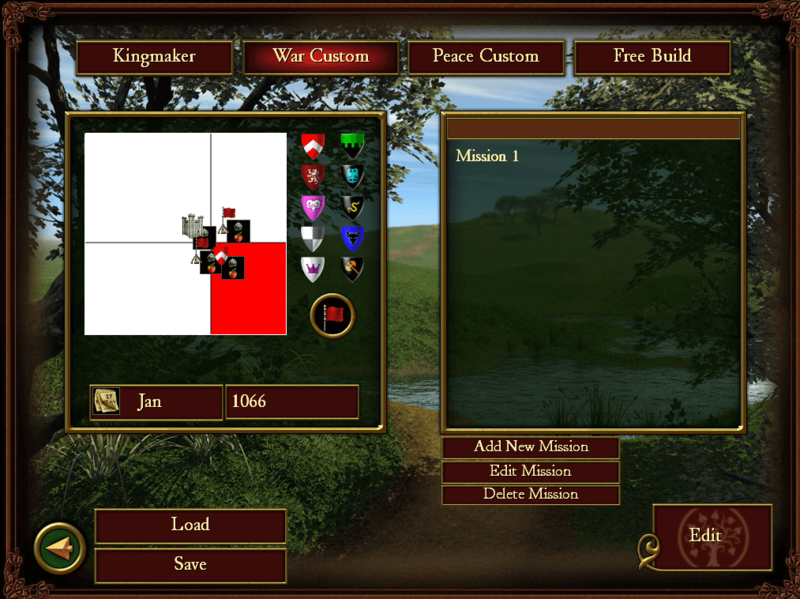 One other important point to note when placing buildings in the map editor, it is recommended you do not place and buildings in enemy estates for Kingmaker maps and leave the AI to place buildings. This is because it makes the AI far less agressive during the game. You can also select what production that village is responsible for, and the size of the estate. By default all village estates produce Apples. Note that the resource type must exist inside that estate (e.g. to produce Pitch, marshland must exist), but you can change this to anything in the list. If you don't set an owner for village estates, these estates will be neutral estates in the game. In each production option above, each Hovel represents additional housing in that village for 8 peasants. If you place a custom Keep in that estate, this provides housing for 8 peasants as well. It should also be noted that castle estates which are owned by AI Lords sometimes overrirde these settings to a certain extent. For example, if you tell a castle estate to make Cheese, it will do so, but not until it has placed all other resource production buildings, such as various weaponsmiths, first. Each village estate in the game has a name. You can click on the flag of that village to see the name along with other details of the village. On a castle estate, you will only see the name of the Lord in charge of that estate rather than the estate name. To see the name of the village you must use the convert estate to village event or in Kingmaker, capture the enemy castle so that it turns into a village. You have no control over which name appears on an estate. The game selects estate names entirely at random when you play from a pre-generated list. The same estate name is never used twice as well. You could try consistently repainting estates in the map editor to change your estate name, but this is a very time consuming procedure and not guaranteed to always work. You can also transfer estate names from one estate to another by painting over the two estates and swapping their colours. If you do this though, remember to make sure your marker flags are still intact! If you paint over a marker flag, you will have to replace it. The full list of estate names is shown below. It's worth noting that while they are chosen randomly, the random generator doesn't appear to be very good and often comes up with the same names repeatedly a lot of the time.